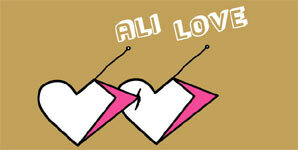 Ali Love releases Secret Sunday Lover on July 16th 2007 through on Columbia Records. Inspired by dance, romance, and ending too many lost weekends at his friends' cult London underground club Secret Sundaze, Ali Love returns to the dancefloor he loves with this disco glitter bomb of forbidden love. Sounding like the abandoned lovechild of Chic and ABC, this is Ali knotting together gritty electro and shiny pop, soul and showbiz all into a rope ladder to the top. Taken from his debut album Love Music (released September 17th), Ali's take on disco, soul, rock n roll and pop is both original and refreshing. Listen to Love Music and you'll hear Lou Reed and Iggy, The Beach Boys, P-Funk beats, hints of Kool & The Gang or Earth, Wind & Fire's disco grooves along with Phil Spector pop, Latin hip hop and of course the sound of contemporary clubland, all mixed up in short, sweet, cinematic songs that hook you in and leave you wanting more.